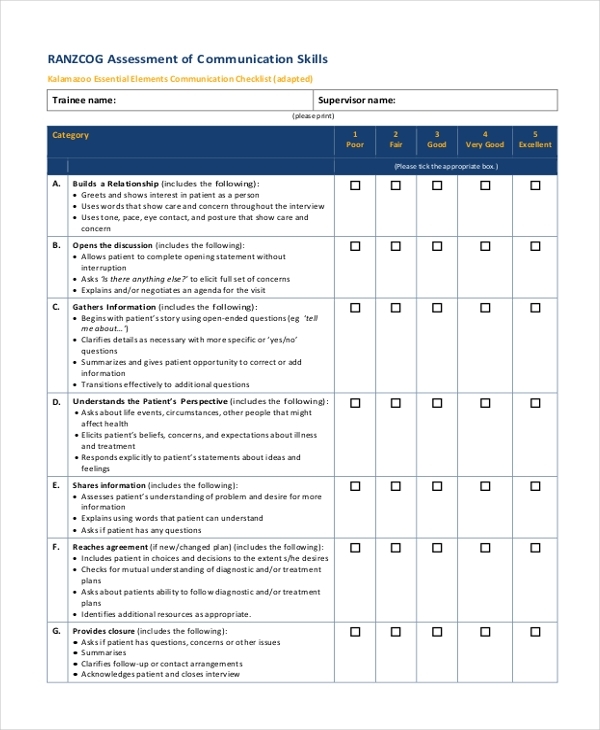 Essentially the purpose and use of a communication skill assessment form is that it serves a tool by which employers, managers, and bosses can know and understand how good or poor a particular employee’s communication skills really are. The examiner ranks the subject’s performance in a category of different situations. 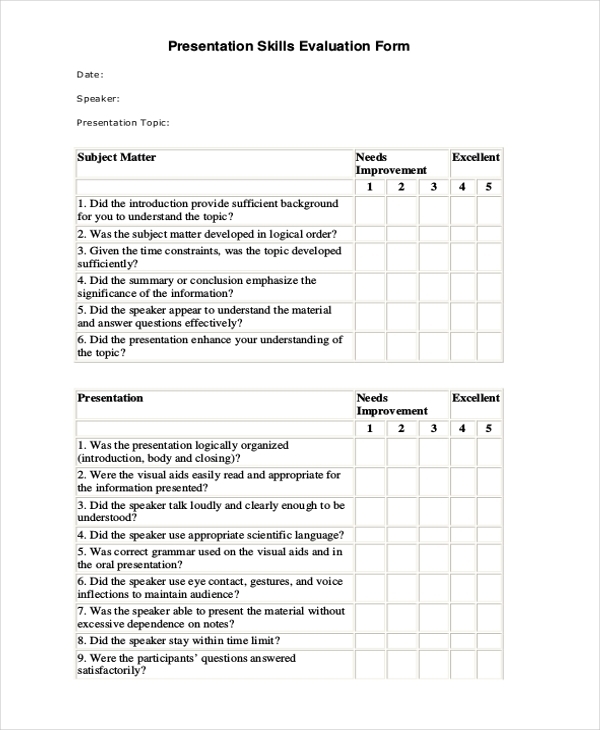 Afterward, the examiner must insert his or her remarks in the form of a summarized feedback. 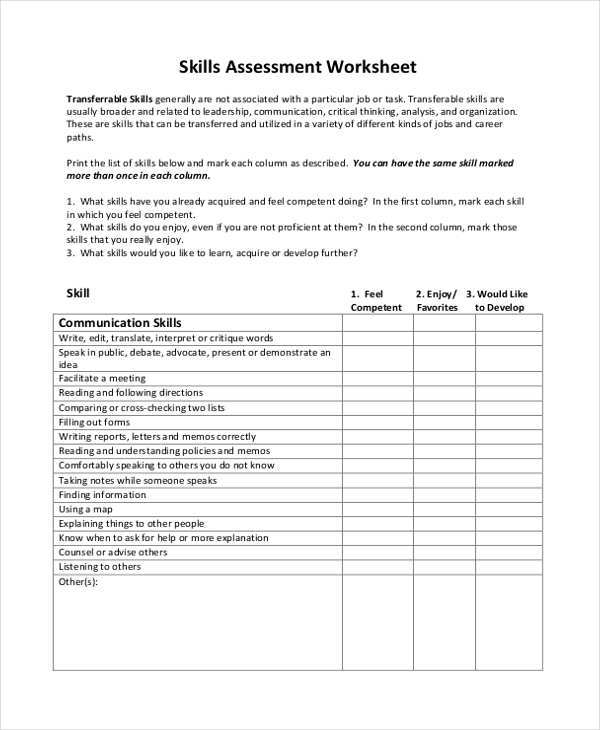 After a student or employee has successfully completed a presentation activity, the audience or the judges are handed out a presentation skills assessment form. The form contains a set of four sections under each there is a group of questions, the answers of which need to be given in the form of scores between 1 and 5. Examining an employee’s performance on the basis of his range of different skills is a task which many companies undertake. 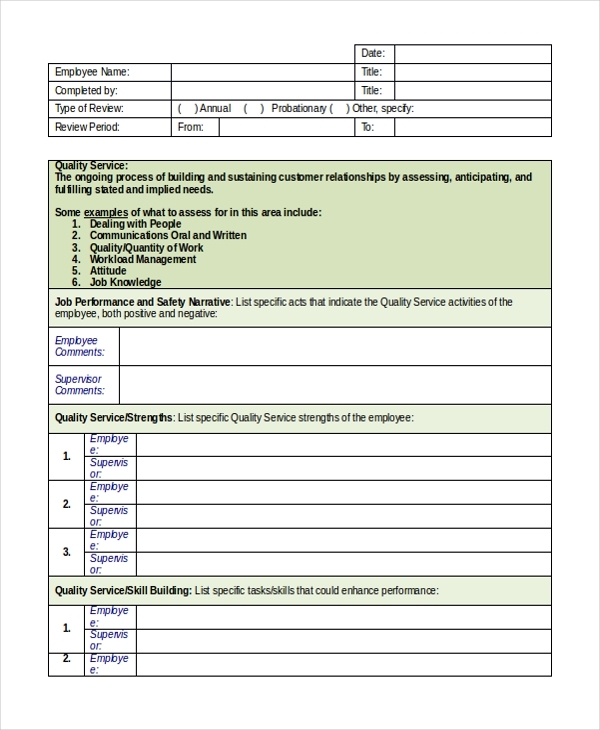 An employee assessment form is an elaborate form divided into multiple subsections. Each sub-head specifies a particular skill, under each, there is a checklist of sub-skills which need to be rated. 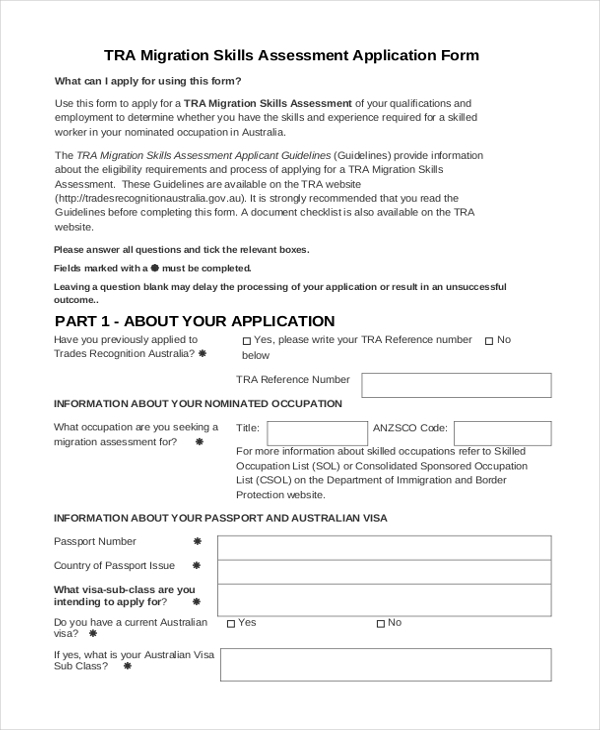 If an individual wants to migrate to another country, it is required that the person submits a skills assessment form providing personal and professional data and other relevant details pertaining to occupational skill sets which the applicant may possess. Human Resources department is known for actively organizing skills assessment programs wherein they adjudge the skill sets of a certain or all employees through different activities and discussions during the program. In such scenarios, a Skills Assessment Evaluation Form is required for enlisting observations and feedback. 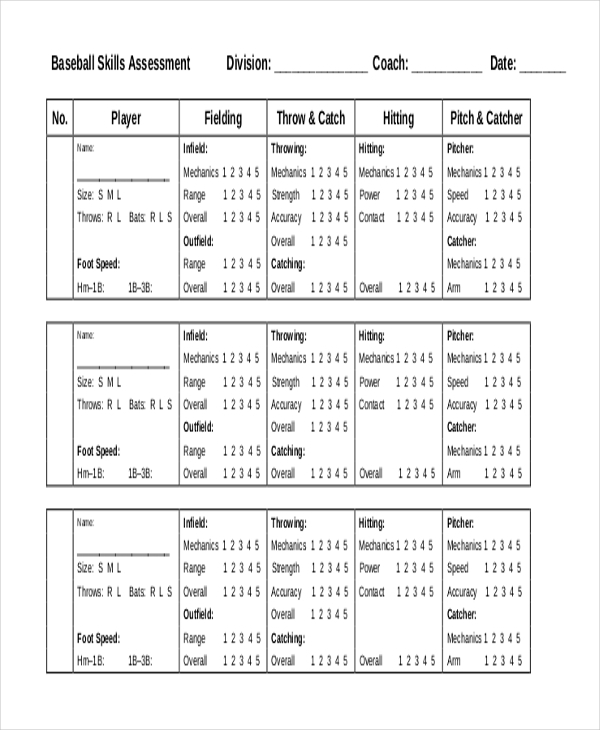 For the purpose of sports teams’ selection, sports associations and councils conduct skill assessment endeavors in order to test an athlete’s level of gaming skills and talent required for playing the game and making a cut into the final squad. 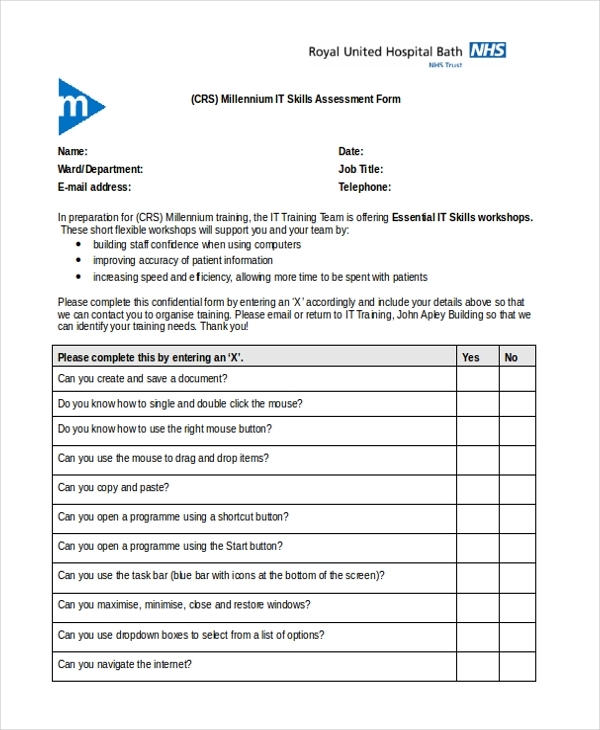 An IT Skills Assessment Form makes itself useful when IT-companies want to conduct assessment program in which an employee or employees are made to appear for an assessment round, on the basis of which the invigilator provides points or remarks for the various parameters given in the form. 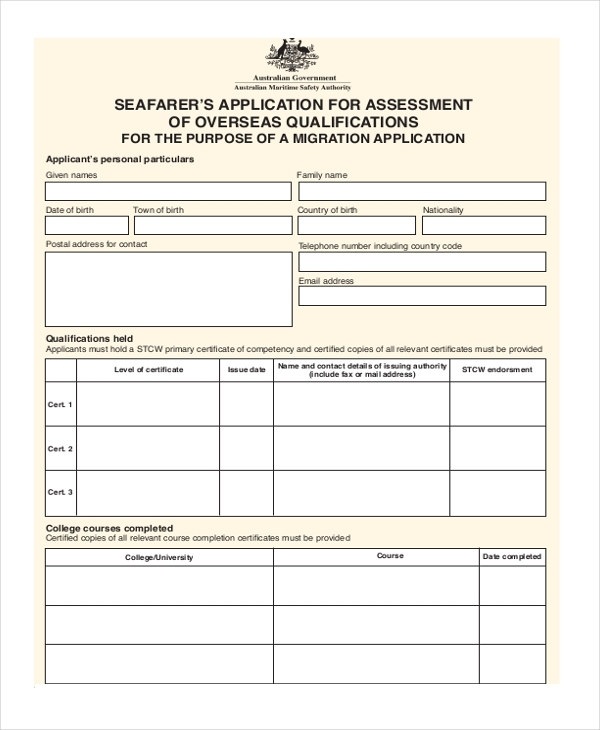 Such a form is used when an applicant files application wherein his or her overseas qualifications would be examined in order to successfully migrate to another country or state. The form stipulates the directives clearly which need to be followed while populating the fields given in the form. If a person wants to apply for the position of a volunteer in a charity organization or a non-profit outlet, in all likelihood they are going to have to fill up a Volunteer Interest and Skills Assessment Form as the first step. It’s a precise document wherein applicant needs to input relevant personal information as well as provide knowledge of areas of interest and relevant experience. Psychologists make use of clinical assessment forms when they have subjects undergoing clinical assessment tests. It’s an elaborate experience so the form is aptly divided into several subsections wherein psychologist have to input remarks and commentary. The target audience for assessment skill form varies from environment to environment. In a corporate office, assessment forms are usually targeted at employees. 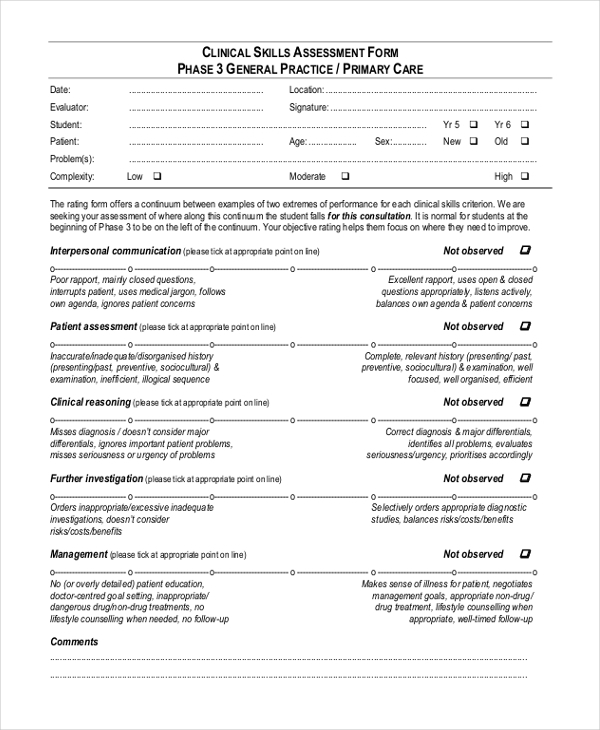 Similarly in clinical and medical settings an assessment form is used to examine various areas of a patient’s mental and physical well-being. Regardless of who the subject is, the end outcome is that these kinds of forms are used as a yardstick to understand how skilled or not individuals really are. Assessing skills is an important professional and personal endeavor. In different environments, the nature and genre of skills assessment obviously vary but ultimately the end result is for the good of the subjects involved. The feedback is honest, precise and topical.